The thing about writing is it is both a solitary endeavour and a public exercise. This is most certainly the case, I believe, with writing RPGs. For them to thrive and survive, they must be shared completely. 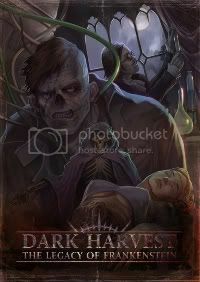 One of the best things about writing Dark Harvest: The Legacy of Frankenstein has been hearing the stories shared by players. Another of the best things (there are many) happened when myself and Matt Gibbs started out on the first anthology. Reading the stories written by other writers was a thrill. Each author turned in a vision of their Promethea. That is as it should be. An RPG setting very quickly gets away from its creator, rising from its slab and breaking free from the castle laboratory to roam the countryside. To thoroughly belabor the metaphor, this monster is a weirdly incomplete one. The details of its features come from the folk it encounters, and it quickly becomes all things to all people. Sometimes, though, it’s nice to have the possibilities laid out for you. It’s nice to know what that monster can do and, more importantly, what you can do with it. Tales of Promethea, that first anthology, did what all of the fiction presented in the Dark Harvest books has always sought to do. The stories gave details of life and death, such as it is, in Promethea, and bags of atmosphere. They gave a feel for the place, a hint of what it must be like to be there. There was lots of potential to bring some or all of the elements presented to your version of Promethea. Tales of Promethea – Unbound makes that process a little easier. Characters are statted-up, scenario ideas laid out, locations described, potential that little bit more thoroughly explored. You can pick and choose what you want still. Not everything will fit into your version of Promethea, and nor should it. It’s yours. The original plan had been to release this material as a book; one of those paper things that download fans keep insisting are out of fashion. This is likely still to happen, complete with added artwork and additional text. The original plans were suspended due to Life™ getting in the way, as it does. Moving directly to a printed thing would have meant a long wait for you guys, something I wasn’t happy about. Instead, it’ll be drip-fed over the coming months, one story at a time. You good folks deserve new content. You do, really. We love you. We cherish you. We watch you through long lenses. We listen to you while you sleep. You look so sweet, drooling into your pillow. As ever, all of us involved are looking forward to hearing your tales from Promethea. Go on, share them. Then it really will be Promethea unbound.